Ryan Blaney’s fourth-place finish in Sunday’s STP 500 at Martinsville Speedway continued his recent string of solid performances. Blaney has finished in the top five for three straight races. 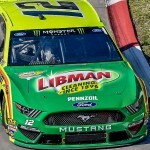 After finishing fifth in the day’s first stage and runner-up in the second, Blaney kept his Team Penske Ford at the front of the field and took the checkered flag fourth in Sunday’s sixth race of the 2019 Monster Energy NASCAR Cup Series season. Blaney has now finished in the top 10 in three of the last four Martinsville races. While Blaney was somewhat pleased with the finish he understands there needs to be work done with his pit crew in order to maintain track position. “Our car was just starting to come to us,” Blaney explained. “We just got to third and the caution came out and I was like, ‘I don’t know if we’re gonna be able to fire off alright,’ and we didn’t and we kept losing spots on pit road and you can’t have that. We would lose at least one or two spots every time we’d come down pit road and you can’t win races like that. Still Blaney is optimistic about the direction his team is heading and remains confident a trip to Victory Lane is not that far off. “We’re right there,” he said. “We just need a little bit more. It’s so hard to win these races. You’ve got to do everything perfect. You’ve got to be good on pit road. You’ve got to restart good. You’ve got to have a good car on both ends of a run and I feel like we’re really close to where we need to be, just haven’t put it all together.